Want to surprise your family and friends with a great and original gift- wrap? At Pro- Party you will find a way to do that. Our new Balloon Gift Wrap allows you to gift- wrap almost anything inside a special 50cm balloon. If you want to bring a birthday gift or even if you want to bring a gift to someone with out any special reason, you can wrap it with our new and original Balloon Gift Wrap. If you want to let your husband/ wife, girlfriend/ boyfriend, partner, family or any other important person in your life, know how much you love him/ her, give them a present wrapped in a printed balloon that says exactly how you feel. We have several balloon prints for a birthday, a first birthday for boys and girls, birth of a new baby (pink or blue), love (red), roses, flowers and clear transparant balloon. See our Printed Balloon section for more information. check our gallery of Wrapping Ideas to see some of the possible ideas to gift- wrap your present. Remember, there are endless ideas to design the Balloon Gift Wrap and to decide what to put inside so, if you have an idea, just let us know and we will do our utmost to make it. Want to know how it is done? 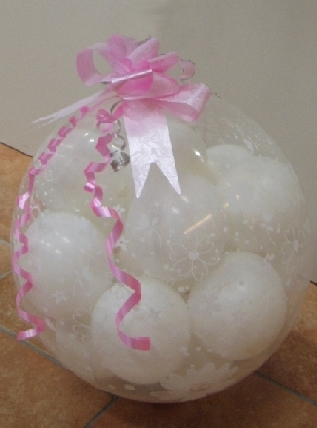 For those looking for a unique wedding gift but do not know what to bring, we can offer an original wedding gift. 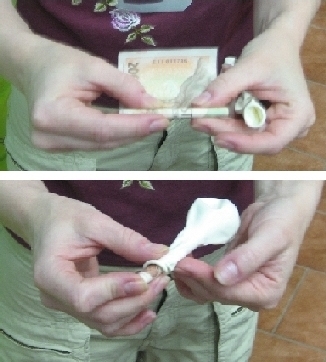 In Czech Republic it is customary to bring money as a wedding gift so why not wrapping it in a fun way? 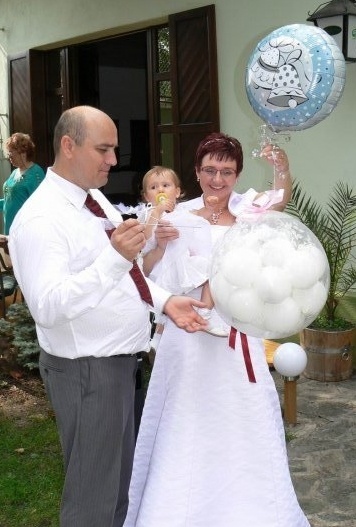 Choose the amount of money you would like to give as a present to the new couple and we will put the bank-notes into several small white or silver balloons. You can leave some balloons empty or fill them with paper confetti. These inflated small balloons we later put into the Balloon Gift Wrap and decorate it accordingly. In order for the new couple to receive their present, they must burst the Balloon Gift Wrap and all the smaller balloons. 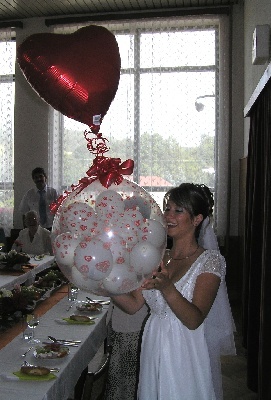 Since the new couple does not know which balloon contains the money and which is empty or contains confetti, they are surprised and excited with every balloon being popped. This is a fun wedding present for both the new couple and for those who brought it. This is the first Balloon Gift Wrapper in Czech Republic, be the first to surprise everyone and bring a gift in this unique gift- wrap.